ca 380 - 370 B.C. Orestes is purified of the crime of matricide at Delphi. The hero sits beside the omphalos stone with a sword in his hand. 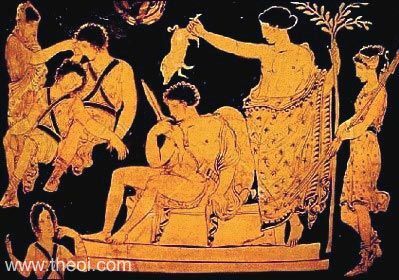 Apollo stands above him performing the rites of purification with the blood of a suckling pig. The god holds a branch of laurel in his other hand. He is accompanied by the goddess Artemis who wears a knee-lenght maiden's skirt and holds a pair of hunting spears. On the opposite side, the three Erinyes (Furies) are appeased, falling into a restful slumber. The ghost of Clytmenestra attempts to rouse them.